Posted on May 3, 2013 by Susan H.
My neighbour and friend, Leslie, is one busy mom…with two of her children in competitive swimming, one of them in rep soccer and a third child in karate….her schedule is all over the place. Leslie was happy to share with me a recipe that her children enjoy as a snack to tide them over between meals when they are on the run. She hoped it might be something my boys would enjoy too. 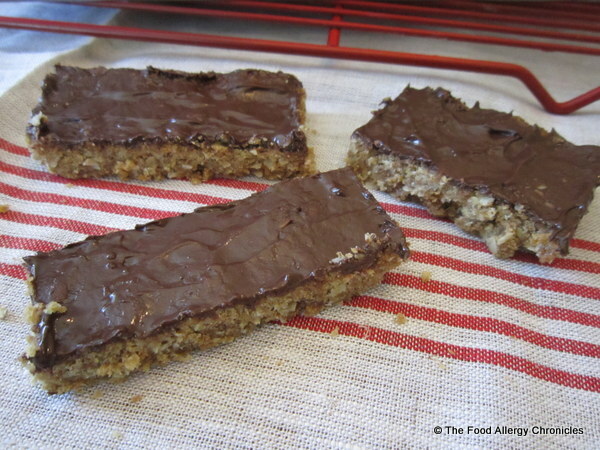 Oats, whole-wheat, wheat-germ, topped with a rich chocolate coating…one hardly notices these are full of fibre! Matthew loved them! This recipe was passed on to Leslie from a long-time friend whose children love them. Surprisingly, her friend named these Brownies…an odd choice as they are nothing like Brownies. A trip up the street to my other friend, Linda’s house where more samples of Dairy, Egg, Soy and Peanut/Tree Nut Free Chocolate Covered Oatmeal Bars were delivered. I am happy to report they were deemed…‘delicious’. 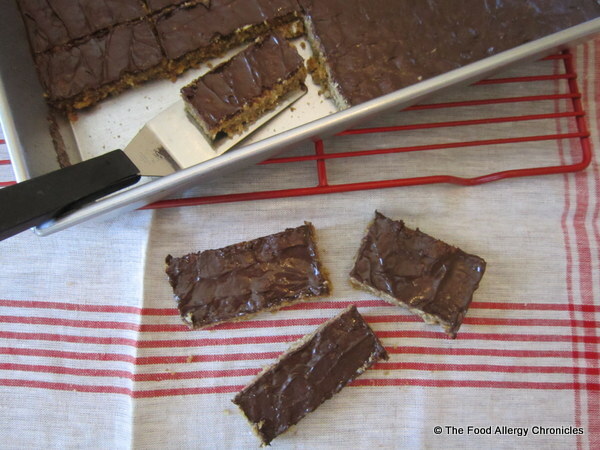 I am always pleased when I can adapt a recipe to be allergy friendly for my boys and at the same time be enjoyed by both adults and children without food allergies. In my eyes…that is what I call a success! This recipe was easy to adapt…I switched the butter/margarine to Earth Balance Vegan Buttery Sticks or for a soy-free version use Earth Balance Soy Free Natural Buttery Spread, the egg to 1/2 tsp baking soda and 2 tbsp. water and I used Enjoy Life Chocolate Chips. In a large bowl, cream the sugar and Earth Balance of your choice. Combine the dry with the creamed ingredient mixture. Pat into a 9 by 13 greased pan. Bake at 375 F for 15-20 minutes or until the edges are golden. Sprinkle the chocolate chips over the top and let sit for 5 minutes. Spread the melted chocolate to cover the top of the oatmeal bars. Let cool completely…will crumble if you cut it while still warm. Tip 1: Leslie’s daughter enjoys her Dairy, Egg, Soy and Peanut/Tree Nut Free Chocolate Covered Oatmeal Bar warmed up in the microwave…her son Alex offers it up for dessert with a scoop of ice cream…while Evan, I believe he eats it anyway he can! Tip 2: I like to ‘tweak’ recipes…Here is my updated even healthier version of Dairy, Egg, Soy and Peanut/Tree Nut Free Chocolate Covered Oatmeal Bars…Oatmeal and Chocolate with a touch of cinnamon…yummy! 1) Use an equal amount of canola oil for the Earth Balance Vegan Buttery Sticks. 2) Use a flax egg (1 tbsp. flax meal mixed with 3 tbsp. water and let rest in the refrigerator while you put together the rest of the ingredients) and add to the oil and sugar mixture. 3) Add 1/2 tsp cinnamon to the dry ingredients. 4) Reduce baking soda to 1/2 tsp and omit the 2 tbsp. water. I dropped off samples at Leslie’s house…what would her children make of the change? They loved them both! 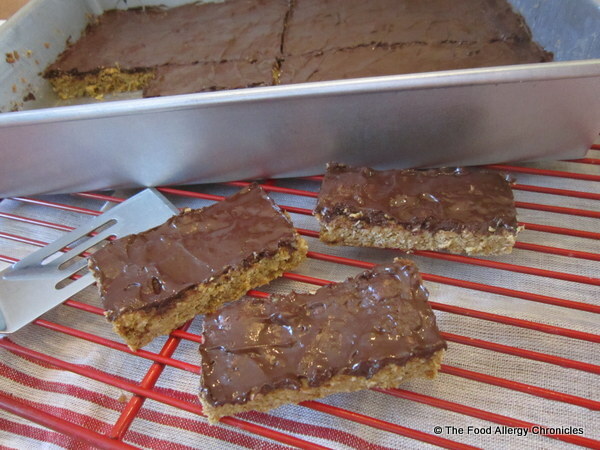 If you are looking for an Oatmeal Bar…bake the original version. For more of an Oatmeal Cookie…bake the updated version. I happen to prefer the cookie version better…which would you prefer? This entry was posted in allergies, baking, cookies, dairy free, egg free, multiple food allergies, oats, peanut/tree nut free, sesame free, soy free and tagged Dairy Egg Soy and Peanut/Tree Nut Free Chocolate Covered Oatmeal Bars, Earth Balance Soy Free Buttery Spread, Earth Balance Vegan Buttery Sticks, enjoy life chocolate chips, Enjoy Life Chocolate Chunks by Susan H.. Bookmark the permalink.